I have been playing fiddle-style harmonica for 28 years or so and am interested in sharing information with other players with similar interests. I am a member of the International Bluegrass Music Association (IBMA), the Central Texas Bluegrass Association (CTBA), the Bay Area Bluegrass Association (BABA), Austin Friends of Traditional Music, the Austin Chapter of the Harmonica Organization of Texas (HOOT), and the Society for the Preservation and Advancement of the Harmonica (SPAH). I am one of the songwriters of American Heritage, and I currently play for RedEye, Manchaca All-stars, the Blazing Bows, and K. R. Wood. I also occasionally play for the Ledbetters, the High Stakes Rollers, Wyldwood, Bluegrass Dot Com (also known as "Shawn Spiars and friends") and anyone else who desires my harmonica talents, my vocal harmony talents, my talents with the upright bass, or who needs a mandolin player or a guitar player. Jim Strickland has released his new gospel album to his anxious and appreciative audience. They have been chomping at the bit for this release of his original gospels and are finally sated. If you want to see what everyone is all up about, order his CD at www.frontroommusic.com. Keep tabs on Jim. He is getting ready to release another CD sometime this year. The Central Texas Bluegrass Association is proud to present their CD sampling some of their finest bands. This long awaited CD has top-knotch bluegrass music from deep within the heart of Texas. Both economical and special, this CD boasts 28 tunes (both original and traditional) from 14 bands and only costs $10. (The association is using this CD as a fund raiser.) If you would like to hear central Texas' finest bluegrass, order your CD at www.centraltexasbluegrass.org/cdproject.html. The Houston Chapter of HOOT meets every 3rd Wednesday at 7:30pm. in Room E252 East, Tomball Community College (30555 Tomball Parkway, Tomball, Tx.). For more information, check out the Houston chapter of HOOT at www.hoottexas.com or contact Gary Johnson. If you are a harmonica player in the Austin area (Tx. ), then you ought to drop by a meeting and say "Hello" -- maybe even give us thought or two or a tune off of your harp. (Each meeting ends with a little show-and-tell jam.) Our meetings include club business and discussions, but often also include a workshop or lesson of some sort. We are a small group, but we are talented and growing. We typically meet at the Dougherty Arts Center, 1110 Barton Springs Road, in the main auditorium on the 2nd Monday of the month. To check the next meeting date, go to www.hoottexas.com - Austin chapter - meetings or email Tom Stevens. The High Stakes Rollers, a skilled and talented bluegrass variety group based in Austin, Tx., have produced a CD of their live performances. On that CD, I am honored with an appearance playing harmonica on the swing/bluegrass tune "Little Rock Getaway". To get your own CD for $10, email Cara Cooke or Eddie Collins. More information and materials are available from Eddie Collins at http://www.eddiecollins.biz. The Old Settlers Music Festival (Salt Lick Pavillion, Austin, Tx. ), is getting ready for the next festival (April 17-20, 2003). For the last 3 years I have given a bluegrass harmonica workshop at this festival that has been very well received. If you are interested in bluegrass harmonica, then put this festival on your schedule. The festival line-up every year is exceptional. Plenty of bluegrass. Plenty of other stuff. Last year they included a young musicians contest. They have four simultaneous stages to keep you busy all day long and through most of the night. Check out www.oldsettlersmusicfest.org for more information. 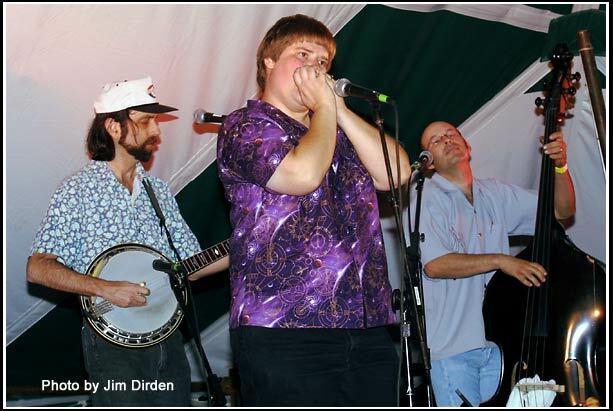 The Austin Friends of Traditional Music have asked me to lead a harmonica workshop for their annual festival at the Dougherty Arts Center (1110 Barton Springs Road, Austin, Texas) on Saturday, Feb. 1st, 2003 (5pm.) The festival begins at noon with a show from the great Scottish singer/songwriter Ed Miller, and just gets better from there with shows from the Double Eagle String Band, the Grazzmatics, the Slim Richey Dream Band, ... There will be music and various dance and instrument workshops from noon until midnight. Come visit! The South Texas Music Festival has also asked me to lead their harmonica workshop for their annual festival in Mercedes, Texas (near the Mexican border). This festival is a great music festival with a wide variety of acts (national and local) and a wide variety of contests -- including the Texas International Harmonica Contest (the only harmonica contest I've found in Texas so far). This festival is frequented by musicians from all over the country (not just from Texas), many of whom are the best exports their part of the country may have to offer. Come down and join us! Recordings of Lonnie's music, and the music of harmonica legends Deford Bailey and Wayne Raney, can be obtained from Lonnie's website at www.lonnieglosson.com for a very reasonable price. Many of these recordings are rare and are a must have for any avid bluegrass/country blues harmonica player. Add some to your collection! Camp Bluegrass & Swing Camp 2003 is scheduled for the week of July 21 through July 25, 2003, and will be held on the South Plains College campus, 1401 College Ave. Levelland, Texas 79336. Camp Bluegrass' faculty this year will include Bill Keith, Alan Munde, Wayne Shrubsall, Gerald Jones, Roland White, Steve Smith, Adam Granger, Dix Bruce, Jim Nunally, Dede Wyland, Ed Marsh, Joe Carr, Dale Morris, Bill Bryson [bass teacher extraordinaire], Tim McCasland. It was a blast last year, and we learned a lot. Swing Camp (with Slim Richey) was also a blast last year and will be again this year. With instruction, room, and board totaling less than $500, you can take an economical vacation for a week and learn about your favorite music or instrument at the same time! These camps are worth the trip! Try them out! Note: While bluegrass harmonica is not one of the "official" study topics offered at Camp Bluegrass, I expect to be there again this year and I always like to meet and trade information with fellow harmonica players when I find them -- and there usually are a couple. If you want to ask them to include harmonica in their week of instruction, email them. An email address is provided for just such things on their website. They always encourage and listen to ideas, suggestions, requests, and feedback. Also catch the Manchaca AllStars on the CTBA band sampler currently available from the Central Texas Bluegrass Association. And keep your eyes peeled for the expected release of the new Manchaca AllStar Live CD -- due to be released sometime this year. After 20 years of playing together, we finally decided to take a chance and record ourselves! Old Settler's Music Festival -- Gearing up for the upcoming festival. Bluegrass Harmonica workshop! Check out the stellar line-up of talent -- good for all bluegrass and acoustic music fans! !